Traditional handymen never leave home without a trusty, multi-tool pocket knife. 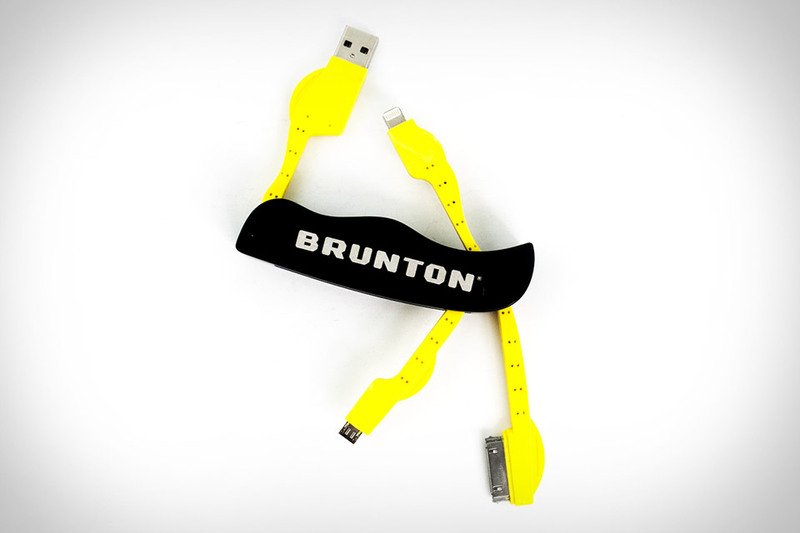 Modern day digital handymen don't leave home without the Brunton Power Knife. Measuring just four and a half inches long and weighing just over half a pound, this clever gadget features fold-out connectors for Apple Lightning and 30-pin as well as Micro USB ports, with a standard USB plug on the opposite end. It ensures that no matter what you encounter, you'll be able to keep your gear charged up. Ditch that janitor-like bulge of keys you carry around and put them back in your pocket where they belong with the KeyDisk. Built using sandblasted and anodized aluminum, it weighs just over an ounce, measures just two and a half inches across, and holds up to six keys using aluminum screws places through the holes, letting you expose only the one you need at the moment, while keeping the rest out of sight. You can even attach it to a standard keychain — but what's the point of that? Should Apple get their way, we'll all be paying for stuff with our phones/watches in the very near future — but if you'd like to consolidate your wallet without giving it up completely, the Plastc Card is for you. Meant to replace up to 20 cards while being nearly future-proof, it features a magnetic stripe, barcode display, NFC, Chip, and PIN capabilities, Bluetooth for syncing with the sleek app (that also lets you check your many balances in one place), and wireless charging. Best of all, you control the action via an E-ink touchscreen, giving you security measures and convenience that competing cards just can't offer. If you're serious about protecting your data — so serious that you'd destroy your storage just to keep it from falling into the wrong hands — then A) you're probably a spy and B) you need these Self-Destructing SecureDrives. These speedy SSDs are self-encrypting and boast a number of self-destruct triggers that will destroy the NAND flash chips. Triggers include if the drive is disconnected from the SATAII interface, if its internal battery level falls too low, if it's away from a GSM signal for a pre-determined amount of time, if it feels the tap signature you've set up, or if it receives a specific SMS message, the latter allowing you to destroy it from anywhere you can find cell service — no more chasing the guy with the briefcase onto the roof of a moving train. Keep track of all your battery-powered toys and devices with the Tethercell. This brilliant, app-connected add-on works with any device that takes AA batteries. You simply replace one of the AAs with the Tethercell, which has a AAA cell loaded inside. Once connected to the app, you'll be able to remotely turn your battery-powered stuff on and off, set device schedules and timers, get alerts when the batteries are running low, and, soon, even find Tethercell'd devices via a proximity function — so you'll never have to dig for the TV remote again. Storing your photos, files, music, and videos in the cloud is great — but it requires an Internet connection for access, and in case you haven't heard, there's always the possibility that someone could hack your account. The Mblok solves both these problems by holding up to 256 GB of your stuff in a tiny, portable package that you can take with you anywhere. This personal cloud-like box connects to up to seven of your devices via Bluetooth 4.0, offering immediate access to your data. The battery lasts for up to 300 hours on a single charge, the app offers one-tap backups, and best of all, your data is protected with 128 bit encryption — so no one's going to see your naughty selfies, even if they steal your device. Finding the balance between blocking out harmful sounds while not making things so muffled that they are difficult to recognize can present quite the dilemma. That's where Dubs Acoustic Filters comes in, developed by acoustic engineers and designers, they are pre-tuned to target specific frequencies, reducing the volume without sacrificing that essential clarity. Featuring a 12 decibel Noise Reduction Rating, Dubs provides the opportunity to fully experience your surroundings without the threat of hearing loss.